Many different diseases and illnesses may require supplemental oxygen, such as asthma, COPD, cystic fibrosis, pneumonia and sleep apnea are a few that may require oxygen. Many patients use nasal cannula to receive their supplemental oxygen, but there are a few people who prefer or need to use oxygen masks instead. Nasal cannula is often more comfortable than oxygen masks, and it allows the patient to have more ease talking than they would with a mask. Cannula also takes up less room and can help the patient feel less claustrophobic than using a mask. Masks can provide a more constant level of oxygen (commonly a preset amount) and can help control carbon dioxide retention as well as supply the patient with oxygen. Oxygen naturally occurs in room air around 21% and anything higher is considered a drug. Too much oxygen can be damaging to the patient’s health, and it can result in the patient becoming dependent on high levels of oxygen. Nasal cannula is a device that helps deliver oxygen from an oxygen supply source (i.e. oxygen tank, portable oxygen concentrator) to an individual needing oxygen. The lightweight tube has two prongs that fit into the nostrils, wraps behind the ears and attaches the oxygen supply source (i.e. an oxygen concentrator or a hospital wall). 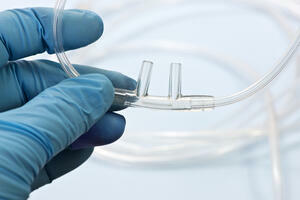 Common use of nasal cannula in adults can carry between 1-5 liters of oxygen per minute. For those who may need higher flows of oxygen, nasal cannula can also be high flow and carry up to 60 liters of oxygen per minute. Nasal cannula can make your nostrils dry, but there are attachments that can add moisture and warmth into the air to make it easier to breathe. 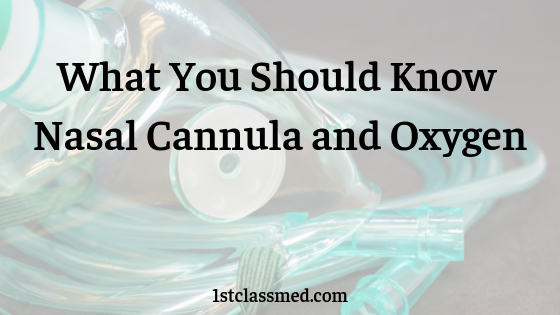 Cannula is a great option for those who need oxygen regularly, but don't want the restriction of a mask. Oxygen masks can be either an oral/nasal mask or a full-face mask. The mask can be made out of a few materials, such as plastic, rubber or silicone. 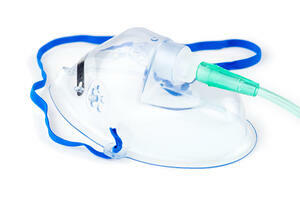 Medical oxygen masks are often made out of polymer, as it is soft and somewhat flexible. To hold the mask up, an elastic strap is connected to either side of the mask and then wraps around the patient’s head. Average flow rates for those who use a mask is between 6 and 10 liters per minute, and the oxygen percentage ranges from 40% to 60% oxygen. The minimum of 6 liters flow rate is required to help remove the exhaled carbon dioxide to remove through small holes on the side of the mask. A mask is a great option for those who have carbon dioxide retention and need a little bit of help with removing the carbon dioxide. As with everything, there are risks involved with nasal cannula and oxygen masks. Luckily, the risks are not very severe and are considered low-risk. Common issues with nasal cannulas are the constant nasal dryness, and the risk of high oxygen levels which can be damaging to the patient’s health. There are devices that can attach to the patient’s oxygen supply source to add moisture into the air, so the nasal passages are less irritated and dry. It is possible that skin irritation can occur with the cannula or a mask, as it can rub against the skin. This can be remedied by using over-the-counter (or prescribed) ointment that can help minimize chafing and skin irritation. There is also a risk of fire, as oxygen can facilitate combustion. For those that use oxygen, posting signs nearby that say “No Smoking” can help minimize the possibility of fire. The patient should make sure to keep their oxygen supply source away from aerosols, candles, fireplaces and stoves. Though oxygen has may benefits, there are still severe complications if the patient is not taking the prescribed amount. Pulmonary oxygen toxicity can occur when your body is given too much oxygen, which can result in pain behind the sternum and even a cough. The average oxygen user, who is on a set liter per minute by their doctor, is not at risk for oxygen toxicity. If the patient has been using a higher level of oxygen than prescribed, contact their doctor if they notice any symptoms, such as a tickle when inhaling, burning when inhaling, a cough, and fever. As medicine and science are continuing to advance, there is hope for new and more comfortable ways to receive oxygen for those who need it. Currently, oxygen therapy can help improve quality of life in many who need supplemental oxygen. This not only helps improve quality of life, but it can help with their ability to participate in activities, sleep better and even live longer than without oxygen. Supplemental oxygen can also be prescribed to be used during sleep or exercise, which may require the use of cannula or a mask to help the patient breathe during this time. For those that use oxygen, nasal cannula and oxygen masks are both common methods of delivering oxygen from the supply source. There are benefits of both nasal cannula and oxygen masks, and it is up to the doctor and the patient to determine what may be best for them. There are also many risks of both delivery methods as they can be damaging for your skin and nasal passages. Pulmonary oxygen toxicity is very dangerous, but if the individual is on a prescribed liter per minute and follows it, they have no risk of developing pulmonary oxygen toxicity. Supplemental oxygen is very helpful for many people, providing them with necessary oxygen to go about their daily life.